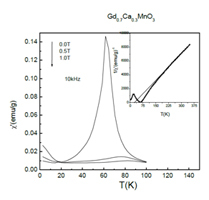 The gadolinium-based perovskites Gd0.7Ca0.3MnO3 (GCMO) and Gd0.7Ca0.3CrO3 (GCCO) have been investigated and compared through their structural, magnetic and transport properties. It was found that both the compounds have completely different magnetic ground states but have similar crystallographic structures and exhibit negative magnetization at low temperatures in the field cooled (FC) process. Isothermal (2 K) magnetization values under applied magnetic field of 55 kOe recorded for GCMO and GCCO are 2.54 μB and 3.57μB, respectively. These low values indicate the antiparallel alignment of Mn / Cr and Gd sublattices. The conductivity data follows small polaron hopping (SPH) model for GCMO throughout the measured temperature range (5 - 400 K), while it shows a transition from SPH to variable range hopping (VRH) mechanism at low temperatures in case of GCCO.